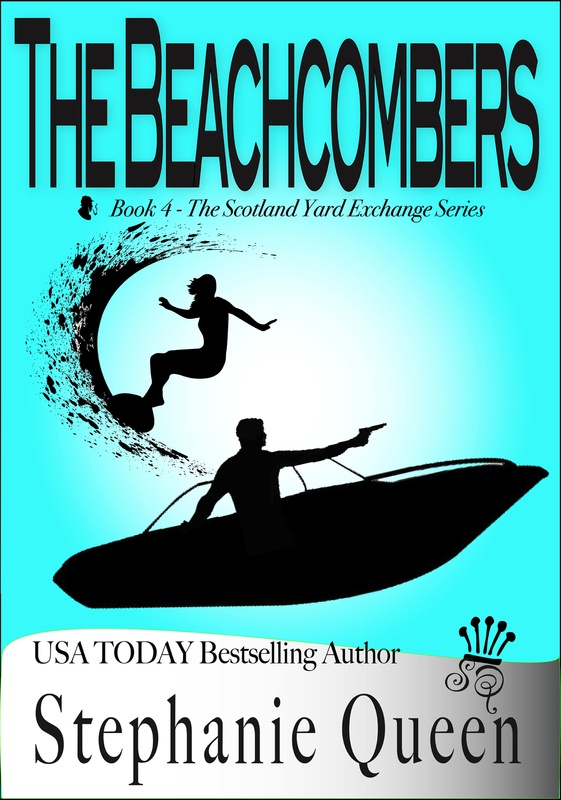 I appreciate the guest post with Leanne Tyler to showcase my latest release, a romantic suspense novel, The Beachcombers, Book 4 of the Scotland Yard Exchange Series. It’s arriving just in time to celebrate the last stirrings of the summertime vibe. If you enjoy tortured alpha male heroes, then you’ll want to hug Dane Blaise and sooth his soul. The new release price for the next two weeks is $.99! So far Shana’s first undercover assignment held about as much promise as her first attempt to capture a rabid kangaroo on the loose. She had not expected, after flying all the way from Sydney to London—Goddamn London—in a state of heart-stopping excitement about her brand new post, that she would be ordered that same day to leave and fly to Boston. Goddamn Boston. Then adding to her travel torture, she’d raced across Logan Airport to board a shuttle plane to fly her to the tiny island of Martha’s Vineyard. All for the purpose of ending up on another beach, with another surfboard, about to prance around in yet another bikini. Fifty-six excruciating hours and over two thousand witless miles later. The same Goddamn exact place she’d started—metaphorically speaking. Scowling at the spiffy smiling young man seated next to her as the small plane skipped to a stop on the short runway, she reached into her shiny new undercover bag to retrieve her phone. She paused to check the caller ID as the theme song from Mission Impossible blared. She may as well have chosen Surfin’ USA for her ringtone. Of course the number was blocked. It was either the Director of the Scotland Yard Exchange in Boston or the Governor of Massachusetts. Standing carefully in the aisle so she didn’t hit her head, she tapped the phone on and pressed it to her ear. Be positive. Or at least be professional. Mindful of her role, she glided forward down the aisle as if she owned the plane, a cool smile carefully applied. The Director of Scotland Yard Exchange told her she’d be meeting her new partner—and nothing else useful unless she counted his insistence that she enjoy the beach weather. She kept her reflexive snort in check. Stepping outside the hatch into the mild sunshine, she readied herself to face someone named Dane Blaise, an independent operator and her new partner. Whoever the hell he was. Dane Blaise leaned against the wall outside the terminal of the tiny airport in Edgartown on the tiny island of Martha’s Vineyard. It had been his corner of paradise every summer for years and, this summer, a much-needed respite from the world at large. Until today. He played with the pack of cigarettes he’d purchased for effect. He wore his only button-down shirt—a white linen deal with the long sleeves rolled up so he didn’t have to bother buttoning the cuffs. The sun blazed. This was a far cry from the drink on the terrace at the Haven Cafe he’d planned with a certain lady he’d met the day before. At the very least, he should be on the beach where he belonged, resting his soul between assignments. But then he supposed he was no longer between assignments. They had him the second he agreed to volunteer as a judge for the so-called American Invitational Surfing Competition. He watched the low-wing prop plane land and circle around the runway toward the building. But he wasn’t the only one watching. A tall lean striking man in a pale lemon linen suit—seemed linen was in fashion today—strolled outside and smoked a cigar while he talked on his cell phone. If Dane hadn’t been trained to notice these things, he wouldn’t have noticed the way the well-dressed man watched the plane not too closely, especially once the door popped open and the passengers began disembarking. An airport employee came through the terminal building door out onto the cement pad where they stood and headed toward the plane, but the man in the tan uniform stopped dead and looked stunned. A quick glance at the lemon-suited man told Dane he’d stopped everything and stared too. Dane turned back to the plane to see why. A long-legged, shapely woman with billowing sun-bleached hair and wearing a tropical flowered halter sundress and strappy ruby stilettos stepped down from the plane onto the tarmac. If Dane were the kind of man who let out wolf whistles at such visions, Ms. Knockout would qualify. But so far in his life, he’d found it easy to control such impulses in favor of steady yet stealthy stares. He was their man. How many slick French men could there be on the island? The three men watched a state police car pull up around the side of the terminal. A uniformed statie got out and went to meet the leggy blonde—his goddamn partner in this assignment. USA Today Bestselling author Stephanie Queen is a romantic at heart and a writer by nature with the enthusiastic soul of a cheerleader. She enjoys creating stories where her rose-colored world-view comes to life and the good guys always win. Having spent most of her life in New England, she’s attended a few of the area colleges, including Harvard. Although she lost count of all the jobs she had before she settled on being a Novelist, her favorite was selling cookies as a Keebler Elf.